Celia Hutter was born in July 1882 at Wisconsin. She was the daughter of Alois Hutter and Catherine Bindl. Celia Hutter died before 1920. Louis J. Schillinger married Rosina T. Hutter, daughter of Alois Hutter and Catherine Bindl, on 16 November 1892 at Dane, Wisconsin. Herman G. Marklein was born on 3 November 1892 at Wisconsin also reported as 1893. He was the son of George Marklein and Elizabeth Smith. Herman G. Marklein married Erna L. Willey circa 1918. Herman G. Marklein died in 1962. Married Name circa 1918 As of circa 1918,her married name was Marklein. Erna L. Willey was born in 1892 at Wisconsin. She married Herman G. Marklein, son of George Marklein and Elizabeth Smith, circa 1918. Erna L. Willey died after 1985. Name Variation Vincent Marklein was also known as Vince. Vincent Marklein was born circa 1919 at Wisconsin. He was the son of Herman G. Marklein and Erna L. Willey. Vincent Marklein died before 1986. Name Variation Lawrence Marklein was also known as Larry. Lawrence Marklein married Arlene (?). Lawrence Marklein was born circa 1923 at Wisconsin. Lawrence Marklein died between 1986 and 2012. Name Variation Raymond Marklein was also known as Ray. Raymond Marklein was born circa 1924 at Wisconsin. 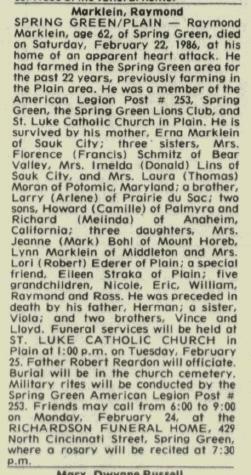 Raymond Marklein died in February 1986 at Spring Green, Sauk, Wisconsin, Raymond Marklein obituary. Lloyd C. Marklein was born in 1925 at Wisconsin. Lloyd C. Marklein died in 1931. Viola G. Marklein was born in 1920. She was the daughter of Herman G. Marklein and Erna L. Willey. Viola G. Marklein died in 1928. Name Variation Irvin Francis Marklein was also known as Ervin Francis. Irvin Francis Marklein was born on 10 February 1894 at Wisconsin also reported as 10 FEB 1895. 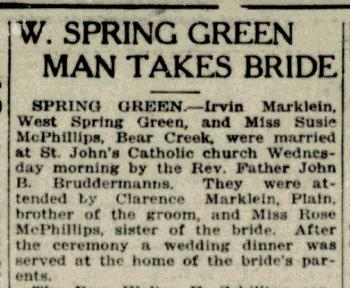 Irvin Francis Marklein married Susan A. McPhillips, daughter of Patrick McPhillips and Catherine Byrne, in September 1919 at Wisconsin Irvin Marklein and Susie McPhillips marriage announcement. Irvin Francis Marklein was buried in 1970 at Saint John the Evangelist Catholic Cemetery, Spring Green, Sauk, Wisconsin. Name Variation Susan A. McPhillips was also known as Susie. Married Name September 1919 As of September 1919,her married name was Marklein. Susan A. McPhillips was born in July 1897 at Wisconsin also reported as July 1896. She was the daughter of Patrick McPhillips and Catherine Byrne. Susan A. McPhillips married Irvin Francis Marklein, son of George Marklein and Elizabeth Smith, in September 1919 at Wisconsin Irvin Marklein and Susie McPhillips marriage announcement. Susan A. McPhillips was buried in May 1951 at Saint John the Evangelist Catholic Cemetery, Spring Green, Sauk, Wisconsin. She died in May 1951 at Dodgeville, Iowa, Wisconsin, at age 53 Mrs Irvin Marklein (Susan McPhillips) obituary. 1905 Bear Creek, Sauk, Wisconsin Susan A. McPhillips appeared on the census of 1905 in the household of Patrick McPhillips at Bear Creek, Sauk, Wisconsin. [S245] U.S. Federal Census 1900 U.S. Federal Census, by Ancestry.com, Year: 1900; Census Place: Bear Creek, Sauk, Wisconsin; Roll: T623_1816; Page: 4B; Enumeration District: 129. [S244] U.S. Federal Census 1910 U.S. Federal Census, by Ancestry.com, Year: 1910; Census Place: Bear Creek, Sauk, Wisconsin; Roll: T624_1736; Page: 5A; Enumeration District: 0110; Image: 777; FHL Number: 1375749. Name Variation James E. Marklein was also known as Jimmy. James E. Marklein was born in 1923 at Wisconsin. He was the son of Irvin Francis Marklein and Susan A. McPhillips. 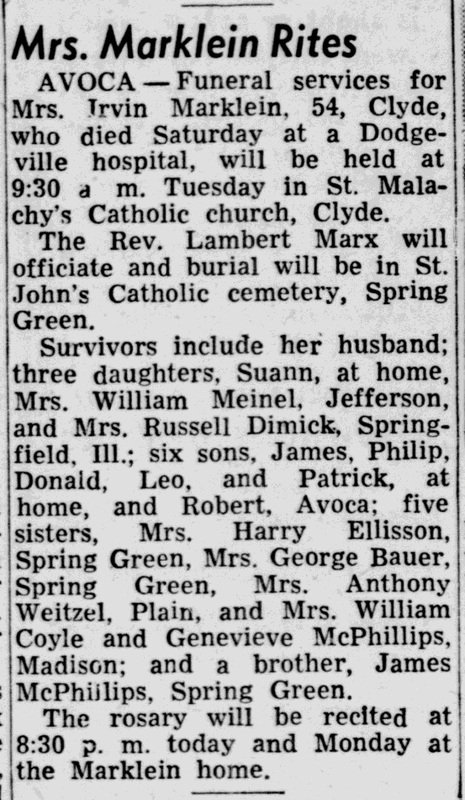 James E. Marklein died on 10 September 1960 at Dodgeville, Wisconsin, Obituary of James Marklein - Wisconsin State Journal (Madison, WI). Name Variation Catherine Rose Marklein was also known as Kate. Married Name 9 July 1949 As of 9 July 1949,her married name was Meinel. Catherine Rose Marklein was born on 23 June 1925 at Bear Creek, Sauk, Wisconsin. She was the daughter of Irvin Francis Marklein and Susan A. McPhillips. Catherine Rose Marklein married William H. Meinel on 9 July 1949 at Avoca, Wisconsin. Catherine Rose Marklein witnessed the marriage of Russell Dimick and Margaret Virginia Marklein on 12 August 1950. Catherine Rose Marklein died on 20 February 2000 at at home, Wisconsin, at age 74 Catherine R (Marklein) Meinel obituary. Name Variation Margaret Virginia Marklein was also known as Peg. Married Name 12 August 1950 As of 12 August 1950,her married name was Dimick. Margaret Virginia Marklein was born on 6 April 1928 at Spring Green, Sauk, Wisconsin. Margaret Virginia Marklein married Russell Dimick, son of Mabel (? ), on 12 August 1950. Margaret Virginia Marklein died on 7 March 2007 at age 78 Margaret V. "Peg" (nee Marklein) Dimick, of Cedarburg, passed away peacefully at her home on Wednesday, March 7, 2007, at age 78. She was the beloved wife of the late Russell Dimick; loving mother of Michael (Sharon) Dimick, Mary Dimick, Margie (Greg) Davis and Meg (Dave) Galioto; proud grandma of Kelly (Richard) Balue, Mark Dimick, Chad, Nicholas and Carly Davis and Jeffrey and Erin Galioto; great-grandmother of Brooke Balue; dear sister of the late Bob (Rita) Marklein, the late Jimmy (Marlene) Marklein, the late Catherine (the late Bill) Meinel, Phil (Rita) Marklein, Lee (Marcy) Marklein, Don (Carol) Marklein, Sue (Phil) McCarville and the late Pat Marklein; and the dear sister-in-law of the late Dorothy (the late Bob) Morton, the late Don (Maxine) Dimick, the late Warren (Helen) Dimick, the late Rex (the late Barbara) Dimick and the late Verian Berg. She is further survived by nieces, nephews, other relatives and many friends. Mass of Christian Burial will be held Monday, March 12, 2007, at 11 a.m. at ST. FRANCIS BORGIA SOUTH CATHOLIC CHURCH, Cedarburg. Interment will be in St. Francis Catholic Cemetery. Visitation will be held Sunday, March 11, 2007, at the CEDARBURG FUNERAL HOME from 1 p.m. until 4 p.m. and also on Monday at the church from 10 a.m. until 11 a.m. In lieu of flowers, memorials of one's choice are appreciated. Mueller Funeral Home W63 N527 Hanover Ave. Cedarburg (262) 377-0380 www.muellerfuneralhome.com. Name Variation Russell Dimick was also known as Rusty. Russell Dimick was the son of Mabel (?). Russell Dimick married Margaret Virginia Marklein, daughter of Irvin Francis Marklein and Susan A. McPhillips, on 12 August 1950. Russell Dimick died before March 2007. Name Variation William H. Meinel was also known as Bill. William H. Meinel married Catherine Rose Marklein, daughter of Irvin Francis Marklein and Susan A. McPhillips, on 9 July 1949 at Avoca, Wisconsin. William H. Meinel died on 23 June 1993. Name Variation William Patrick Marklein was also known as Patrick. William Patrick Marklein was born circa March 1940 at Wisconsin. William Patrick Marklein died before 2000. George Marklein was born in 1865 at Wisconsin. He married Elizabeth Smith on 28 February 1889. George Marklein married Mary (?) in 1920. George Marklein died in 1937. Married Name 28 February 1889 As of 28 February 1889,her married name was Marklein. Elizabeth Smith was born in 1871 at Wisconsin. She married George Marklein on 28 February 1889. Elizabeth Smith died in 1917. Arthur John Marklein was born on 20 April 1891 at Wisconsin. Grace C. Marklein was born in 1897 at Wisconsin. She was the daughter of George Marklein and Elizabeth Smith. Clarence J. Marklein was born in 1901. 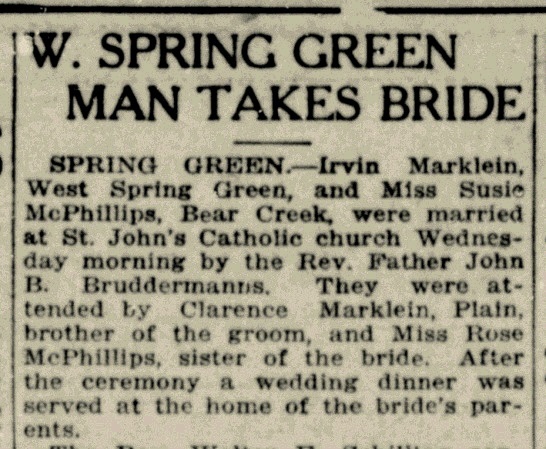 Clarence J. Marklein was the best man at the wedding of Irvin Francis Marklein and Susan A. McPhillips in September 1919 at Wisconsin; Irvin Marklein and Susie McPhillips marriage announcement. Married Name 1920 As of 1920,her married name was Marklein. Mary (?) was born in 1888. She married George Marklein in 1920. Married Name 25 October 1938 As of 25 October 1938,her married name was Soeldner. Leona E. Jasper was born on 17 January 1914 at Wisconsin. She was the daughter of Arnold Jasper and Sophia Braun. Leona E. Jasper married Lawrence A. Soeldner, son of Joseph Soeldner and Kathryn Roth, on 25 October 1938. Leona E. Jasper died on 15 June 2004 at age 90 Leona E. Jasper Soeldner, age 90, a resident of St. Mary's Home, Manitowoc, died on Tuesday, June 15, 2004, at the home. Leona was born on Jan. 17, 1914, in Cazenovia, daughter of the late Arnold and Sophia Braun Jasper. On Oct. 25, 1938, she married Lawrence A. Soeldner at St. Anthony Catholic Church, Cazenovia. The couple moved to Manitowoc in 1938. He preceded her in death on May 15, 1991. Leona was a member of St. Paul Catholic Church, the Parish Women and Manitowoc Senior Center. Survivors include three sons and a daughter-in-law, Leon Soeldner of Manitowoc, Donald and Janice Soeldner of Orlando, Fla., and Vern Soeldner of Eau Claire; eight grandchildren, David of Glendale, Amy of Atlanta, Ga., Julie (Scott) Bernier of Boston, Mass., Daniel (Tanya) Soeldner of Green Bay, and their son and Leona's great-grandson, Ryan, Suzanne (Christian) Barrock of Kohler, Michael of Miami, Fla., Sarah (John Peter) Trask of Milwaukee, and Rebecca of Milwaukee; a brother and sister-in-law, Rinold and Alice Jasper of Richland Center; and a brother-in-law, George Soeldner of Plain. 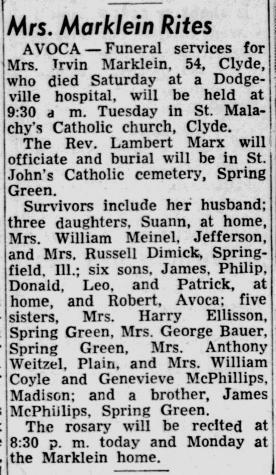 Also surviving two sisters-in-law, Catherine Wiedenfeld of Richalnd Center, and Agnes Olson of Spring Green; nieces; nephews; other relatives; and friends. She was also preceded in death by numerous sisters and brothers; and a twin son. The family will greet relatives and friends at ST. MARY'S HOME CHAPEL, Manitowoc, from 9 a.m. until the time of Mass at 9:30 a.m. on Saturday, June 26, 2004. A memorial service will be held at 9:30 a.m. on Saturday, at ST. MARY'S HOME CHAPEL, Manitowoc. Officiating at the Mass of Christian Burial will be the Rev. Tom Wojciechowski, O.F.M. Cremation has taken place with burial at Evergreen Cemetery, Manitowoc. In lieu of flowers, donations may be made to the Alzheimer's Support Group, the Humane Society or the charity of the donor's choice in Leona's name. The Pfeffer Funeral Home & Cremation Care Center, Manitowoc, is assisting the family with funeral arrangements. Our heartfelt thanks to the entire staff of St. Mary's Alzheimer's Unit; your love and compassion will never be forgotten. Arnold Jasper married Sophia Braun. Sophia Braun married Arnold Jasper. Ralph E. Olson was the son of (?) Olson. Ralph E. Olson married Agnes Soeldner, daughter of Joseph Soeldner and Kathryn Roth, on 21 January 1942. Ralph E. Olson died on 10 August 1959. Arthur John Brey married Anastasia Brickl, daughter of Simon S. Brickl and Barbara Blau. Arthur John Brey was born on 30 August 1892 at Wisconsin. He was the son of George Brey and Theresia Liegel. Arthur John Brey died in 1969. On 5 June 1917 at World War I Draft Registration, Sauk, Wisconsin, reported wife and 2 children. [S245] U.S. Federal Census 1900 U.S. Federal Census, by Ancestry.com, ED134. Dwelling 127. [S244] U.S. Federal Census 1910 U.S. Federal Census, by Ancestry.com, ED115. Dwelling 28. [S243] U.S. Federal Census 1920 U.S. Federal Census, by Ancestry.com, ED164. Dwelling 105. Married Name 4 June 1952 As of 4 June 1952,her married name was Womack. Anastasia Brey was born on 9 September 1914 at Wisconsin. She was the daughter of Arthur John Brey and Anastasia Brickl. Anastasia Brey died on 14 May 2007 at age 92 Anastasia B. Womack, age 92, of Highland, passed away on Monday, May 14, 2007, at Upland Hills Health following a brief illness. The former Anastasia Brey was born on Sept. 9, 1914, to Arthur and Anastasia (Brickl) Brey in Plain where she attended St. Luke's Parochial School. On May 12, 1941, she graduated from the Toebe Academy of Beauty Culture, and from 1947 until the time of her marriage she owned and operated the Harper Method Beauty Salon in Madison. Anastasia married Clarence Womack on June 4, 1952, at St. Raphael Parsonage and she joined Clarence in Highland in the operation of their farm. She was a member of Ss. Anthony and Philip Parish and the C.C.W. Anastasia is survived by her husband, Clarence of Highland; a son, Bruce (Linda) Womack of Highland; a daughter, Mary (Glen) Spurgeon of Highland; seven grandchildren, Dionne Womack and special friend Jody Marti, Denise (Kevin) Rochon, Dana and Darci Womack, James Spurgeon, Kai Tanner and Gavin Womack; two great-grandchildren, Kaylee and Zach Rochon; a brother, John Brey of Reedsburg; a sister, Marian Riek of Sauk City; two brothers-in-law, Lawrence (Marge) Womack of Linden, and David Womack of Rockford, Ill; two sisters-in-law, Dorothy Wilkinson of Linden, and Lois (Loren) Yearous of Madison; as well as many nieces, nephews and friends. She was preceded in death by her parents; a son, Brett Womack; a brother, Herman Brey; two brothers-in-law, Julius Riek and Ray Wilkinson; and two sisters-in-law, Lucille Brey and Mildred Brey. A Mass of Christian Burial will be held at 11 a.m. Thursday, May 17, 2007, at ST. PHILIP'S CATHOLIC CHURCH in Highland with Father Kenneth J. Frisch officiating. A visitation will be held from 4 p.m. until 8 p.m. Wednesday, May 16, 2007, at the church, where a parish rosary will be held at 7:30 p.m. Friends may also call on Thursday after 10 a.m. Burial will be at 2 p.m. at the East Side Cemetery, Dodgeville. In lieu of flowers, memorials may be made to a charity of one's choosing. The McGuire-Peterson-Houck Funeral Home of Highland is serving the family. McGuire-Peterson-Houck Funeral Home (608) 929-4815 www.houckfuneralhomes.com. John Arthur Brey was born on 30 June 1920 at Plain, Sauk, Wisconsin. He was the son of Arthur John Brey and Anastasia Brickl. John Arthur Brey married Mildred Teresa Bindl, daughter of Albert J. Bindl and Adelia E. Soeldner, on 23 October 1946 at Reedsburg, Sauk, Wisconsin. Numerous nieces, nephews along with other relatives and friends. We will celebrate his life with a Mass of Christian Burial on Monday, February 24, 2014 at 11:30 A.M. in Sacred Heart Catholic Church, Reedsburg with Fr. Thomas Monaghan officiating. Visitation will be held on Sunday from 4-8 P.M. at the Farber Funeral Home with Knights of Columbus rosary being prayed at 8:00 P.M.. Visitation will be held at the church on Monday from 10:00 A.M. until the time of service. Burial will follow in Calvary Cemetery, Reedsburg. Memorials of remembrance may be made to Sacred Heart School Endowment Fund or to Sacred Heart Church.